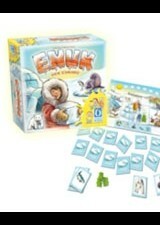 Today Enuk is allowed to join his elder brothers on the tramp - the small eskimo is really excited. He is looking forward to seeing all the polar bears, the seals and the fishes and to feed the reindeers. But the most exciting thing to do is to build the igloo. But the day is coming to an end soon ... Who is able to collect the most animals and build the igloo at the same time?